Nobody is tougher than Jungle Jim. Click here to play! When he gets up in the morning, he does 18,000 sit ups, followed by 28,000 push ups, and then he breaks a solid slab of titanium over his head. For breakfast, he eats flakes of bulletproof glass drenched in hydrofluoric acid. He's a tough guy, is what I'm trying to say. Anyway, Jungle Jim may be tough, but he's also pretty stupid. He eats flakes of bulletproof glass, for Pete's sake! Does a sane intelligent person do that? No. This absolute disregard for higher learning means that Jim occasionally runs into life threatening situations when searches for lost tombs to raid in the jungle. That's why he needs to hire you to point out the dangers and direct him to the good stuff. You need to warn Jungle Jim of alligators, piranha, man-eating plants, panthers, spiders, snakes, log traps, and rival jungle explorers. You'll be handsomely rewarded for your efforts, as if Jungle Jim likes one thing more than being the toughest man alive, it's that he likes just being alive. 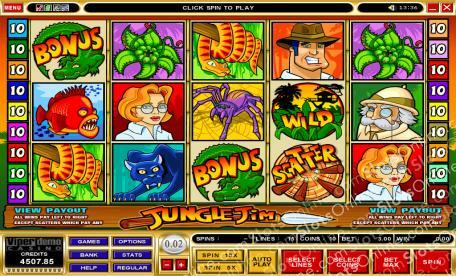 Help Jim explore the jungle in the Jungle Jim slots, and stop him from diving headfirst into certain doom. The Log Trap symbol is the scatter symbol in this game, paying out on the total bet. The scatter symbol pays 3 times the bet for 3 symbols on the reels, 12 times the bet for 4 symbols, and 75 times the bet for 5 symbols. The Wild Jungle symbol can substitute for any other symbol in this game other than the scatter symbol and bonus symbol. The bonus is triggered when 3 or more Bonus Alligator symbols land on the reels. The player is taken to a game where they must choose 1 of the alligators to reveal a number of free spins. They then must choose another alligator to reveal the multiplier for those free spins. Up to 10 free spins can be won, at up to a 5 times multiplier.